On the 28-30 January Tearfund held a three-day Boot camp on ,Training of Trainers on building movements for environmental and economic sustainability, which saw seven of African countries (Malawi, South Africa, Zimbabwe, Tanzania, Mozambique, Zambia, Kenya) came together to learn more on how to sustain, and build the current movements they are involved with , all this took place at the Riverside Lodge in Lilongwe Malawi. The camp had a great team of Anglicans including two of our Eco- Bishops, Bishop Johnson from Tanzania and Bishop Vicente from Mozambique. Bino Makhalanyane represented the Green Anglicans of Southern Africa. 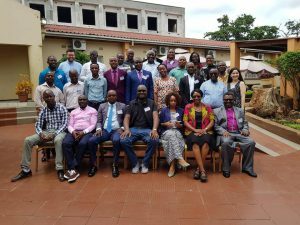 Charles Bakolo from Green Anglicans Malawi and Rev Sam Sifelani of the Green Church movement represented the Province of Central Africa. It was a great experience of learning and exchanging on Care for Creation. The camp was facilitated by the UK Tearfund team where the participants were trained on how to build a movement, how to mobilise and organise ordinary people to become agents of change in advocacy work. One of the key things we learned was that we always need to package our message well so that those whom we need to rally with us will understand the vision well.